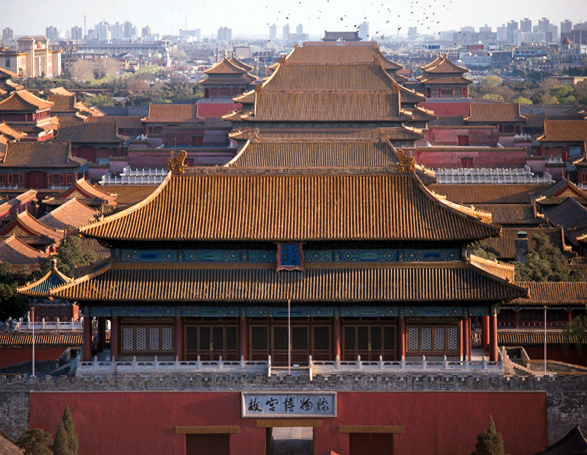 Like the sanctuaries and pyramids in ancient Egypt, the Forbidden City in Beijing has a set of rules governing the choice of its architectural dimensions. Measurements show the layout of individual courtyards in the Forbidden City was designed according to specific ratio. The rear courtyard is 218 meters long and 118 meters wide, and the front courtyard is 437 meters long and 234 meters wide. As a result, the ratios of the length to the width in both courtyards turned out to be the same, reaching six to 11, and the courtyard in the front is twice as long and wide as the rear courtyard, which means the front courtyard is four times the size of the rear one. The Hall of Supreme Harmony was designed according to a nine-by-five standard, displaying overwhelming imperial power. There are nine bays (rooms that are each marked by 4 poles) in length and five bays in width. The ratio of its length and width is nine to five. Both nine and five carried special meanings in ancient Chinese architecture. Numbers can be divided into odds and evens, which fall into the categories of Yang and Yin respectively, the Chinese principle of opposing elements. Within the odds less than ten, nine is the highest one and five ranks in the middle. Accordingly, both nine and five connoted the supreme imperial power in ancient China. Tourists may find that there are 11 instead of nine bays in length in today's Hall of Supreme Harmony. The reason lies in the fact that the original Hall of Supreme Harmony was destroyed by the end of Ming Dynasty (1368-1644) and repaired in 1669 under the reign of the Emperor Kangxi in the Qing Dynasty (1644-1911). Due to the lack of a specific special superior wood during the restoration, the width was adjusted to 11 bays.